From left, Upper Cumberland Human Resource Agency staff member Jenel Hill, county coordinator Larry Davis, staff members Beth Pope and Tim Baines display a replica check for $2,500 from MTE Customers Care. Middle Tennessee Electric Membership Corporation's Customers Care has donated $2,500 of its Operation Round Up funds to Upper Cumberland Human Resource Agency. 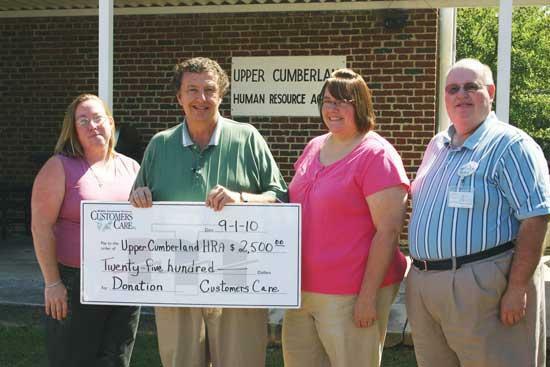 Cannon County’s Upper Cumberland HRA is a nonprofit organization that helps individuals improve their quality of life and provide them with a more productive and independent life. Operation Round Up began in 2003 and has distributed more than $4 million into MTEMC’s communities.